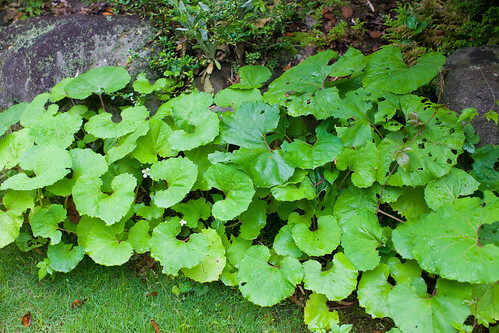 This is known as giant butterbur or what the Japanese call fuki 菜蕗. According to Dave’s Garden, an informational garden website, this is a perenial that requires moist soil, that’s why it grows so well here in the Pacific Northwest. Apparently, it’s fairly easy to grow so many of the local Japanese have this in their garden. This time of year, they’re all most generous, and often share their crop with the community. In Japan, the leaf isn’t consumed, just the stalk. I’d like to describe it as a vegetable that’s similar to a cross between celery and rhubarb. It has that stringy exterior that must be peeled and a strong bitterness, that some say can be toxic. There are various ways of removing the bitterness, so I was planning to ask the advice of a Japanese friend, Mrs. Kawahara, who is a wonderful traditional Japanese cook, as she often shares her cooked fuki. 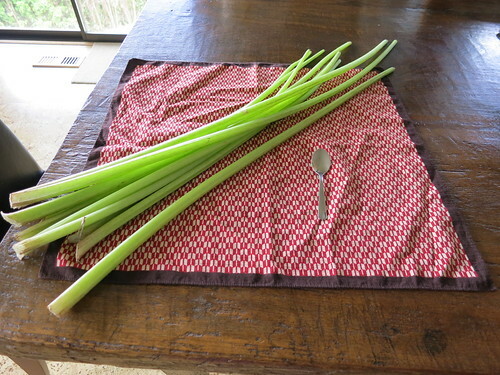 In the photo, I placed a coffee spoon next to the fresh fuki for scale. 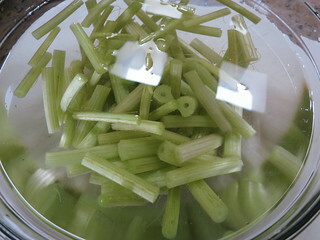 As you can see they are about 3 to 4 times as long as celery. Concerned that they needed to be cooked quickly, and before waiting for proper instructions, I went ahead and washed, peeled, and sliced the fuki. Then soaked it in water. Oops. Wrong procedure. I later found out that you’re supposed to wash, salt, boil then peel and soak. What happened my fuki? Instead of remaining straight, they curled. When I finally got hold of my friend, I told her about my disaster. She was so sweet and said not to worry, because although it didn’t look great, it was still edible. Well, I hate to waste anything, so I followed her advice and boiled them for a few minutes. She said I could just stir-fry them using the typical Japanese flavorings of sake, soy sauce, and mirin. I ended up adding sesame oil to the hot frying pan, sauteing the fuki and taking her advice on the seasoning. 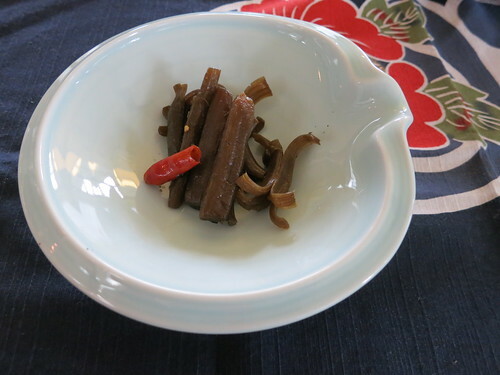 For a little bit of bite, I added two dried red chilies. All in all, the final version was good, but not as good as Mrs. Kawahara’s. Here’s my odd shaped fuki dish! I didnt realize this veggie can be bitter. I had it for the first time in Japan, when my Aunt Aki cooked it in Miso soup. OH MY GOSH! I loved it. It has a light celery flavor and I didnt even know it was bitter. It was sooooo good. Ive seen many recipes with this veg but, where I live, it is hard to find. Thank you for this info! @RedNails – Maybe you can try and grow it yourself. Here in the Pacific Northwest, it seems to grow very well. Sorry I missed your comment. Yes please share! Unfortunately, as far as I know most of these vegetables are not available outside of Japan, unless you grow them yourself or are very lucky and find them at a Japanese grocery store or something like that. Apparently fuki grows quite easily here in the Pacific Northwest. Many Japanese grow it here. Depending on where you live, you may want to give it a try. I live in Colorado and have fuki plants in my garden. I’ll give it to anyone who are interested. I have been trying to locate fuki plants with no results. If you could supply me with some plants I would be greatfull.